Our best price on the ‘Which Best Buy’ Kiddy Evoluna i-Size 2 offers maximum protection for an infant from birth to 83cm (approx. 15 months). The Evoluna i-Size 2 offers the world’s 1st lie-flat technology inside and outside the car, that promotes easier breathing for baby. Kiddy patented lie-flat technology, also allows for an air pocket under the child that helps with air circulation and reduces the risk of overheating. The best, got better. The Kiddy Evoluna i-Size 2 is a rear facing car seat suitable from birth up to 15 months (83cm), meeting the latest ECE-R129 (i-Size) standard, which intensively tests for front and rear impacts, rollover situations, and side impacts. 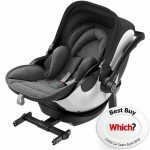 ISOFIX Installation – Simple and safe the car seat in combination with the ISOFIX base can be easily installed in to your car. The base fixes into the car using isofix connectors. With just one click the seat attaches to the base, whilst green indicators show whether the seat is engaged correctly. 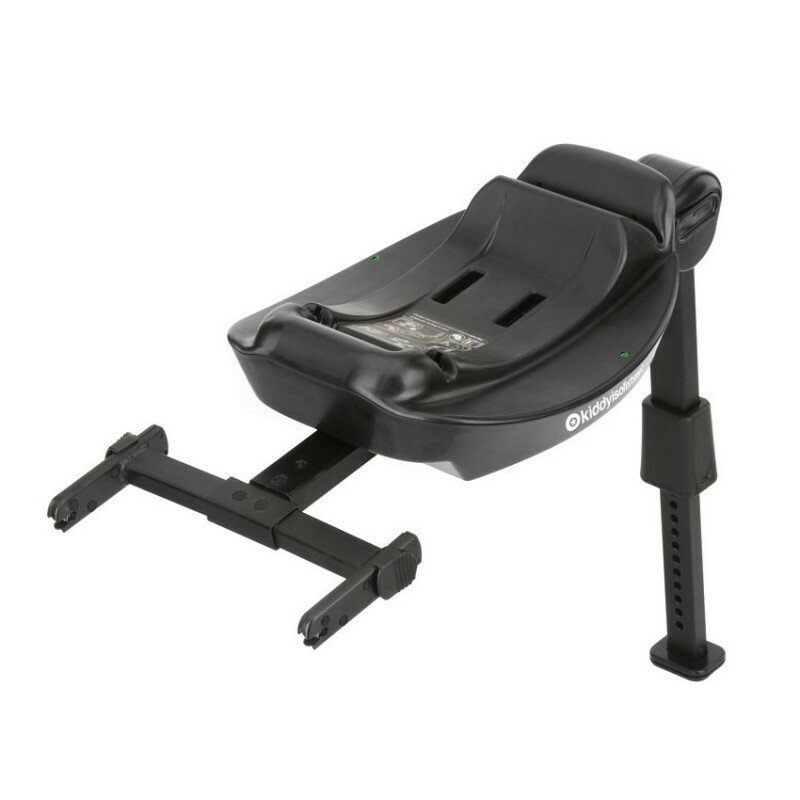 The ISOFIX Base 2 can be adjusted lengthways for a perfect fit, and the adjustable leg ensures a firm foundation onto the floor of the car which stops any dangerous rotation in the event of an impact. Three coloured indicators confirm that the base is correctly positioned for travel. Maximum Side Impact Protection – The energy absorbing layer inside the baby shell as well as the fixed side impact protection components consisting of EPO (expanded polyolefin) ensure maximum side impact protection, together with the protective components that can be attached to the side via the handle. 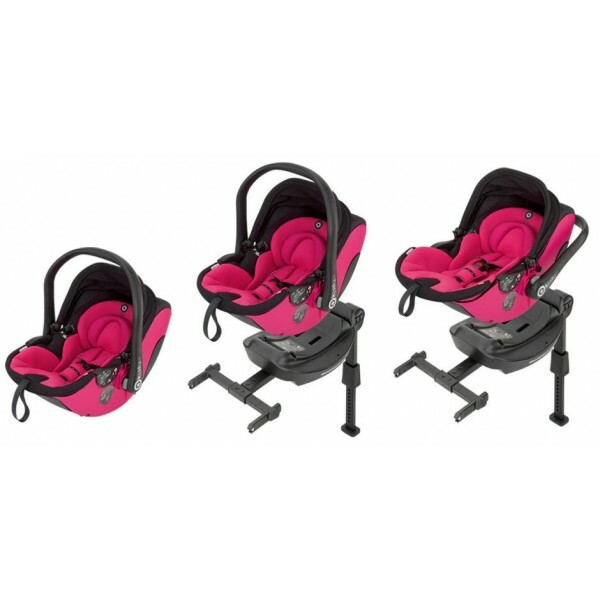 The infant car seat absorbs the collision forces during a side impact. Comfort Features – The generous size, lie-flat position, along with being able to adjust to the size of your baby through the newborn inlays & adjustable 5 position harness system makes the Evoluna i-Size a convenient alternative to the carrycot for buggies. 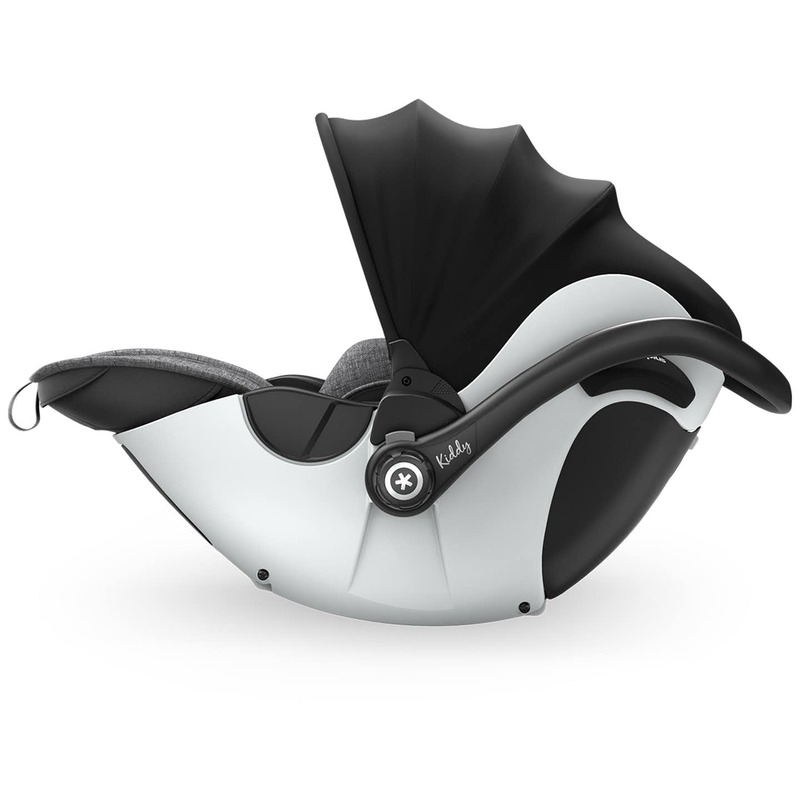 The large sun canopy is fully adjustable so that the baby is protected from the sun and wind. The impact-absorbing slatted frame facilitates air to circulate evenly around a child’s body, which helps to regulate their temperature all year round. Award Winning – The Evoluna i-Size 2 was convincing in the Stiftung Warentest and ADAC child car seat tests in June 2016. Amongst the 26 child car seats tested, the Evo Luna i-Size car seat was the only one to achieve a “very good” (1.5) test score (The best ever recorded). Travel System Compatible – The Kiddy Evoluna i-size 2 is compatible with many leading pushchair brands using adapters including: Egg, Baby Jogger, Bugaboo, iCandy, Joolz, Babyzen, Phil & Teds and many more! Please check you have the right Maxi Cosi adapter. Kiddy Lie-Flat Technology – This tested and patented technology by Kiddy was specially developed for the needs of newborns and premature infants. 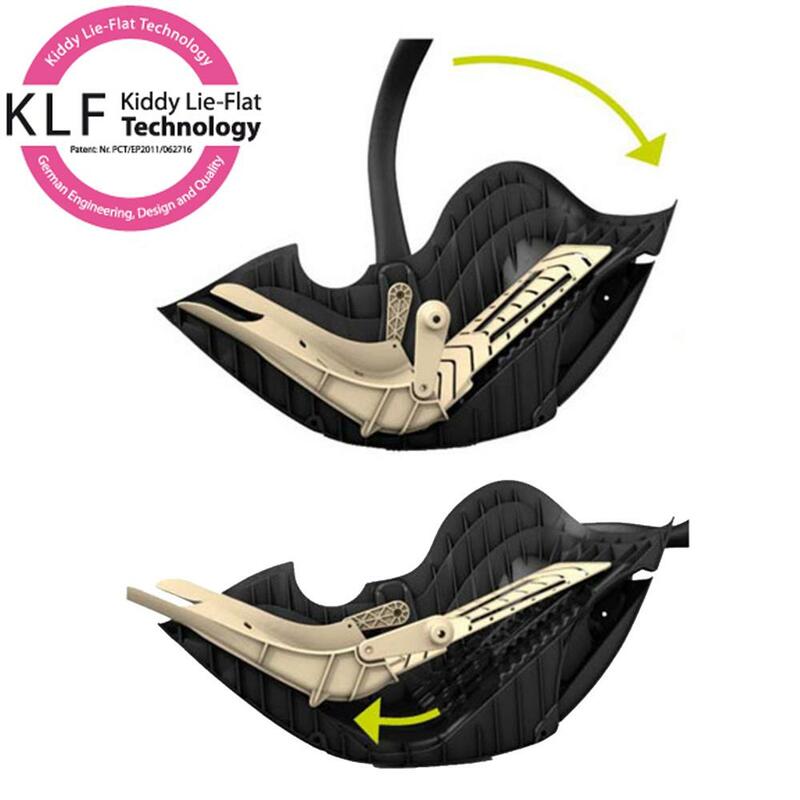 Kiddy Lie-Flat Technology (KLF) enables the infant carrier seat to be moved into two positions; an upright position or a lie-flat position. When the handle is moved backwards, a slatted frame inside the infant carrier lifts up and gently moves the infant into a flat lying position.